The initial public offering of Facebook stock in May, 2012, sent shivers of excitement through investors. The IPO was the biggest in social media history and among the biggest of all time, raising more than $16 billion through the sale of 461 million shares of stock. Within three months of open trading, the vaunted stock lost half of its value. 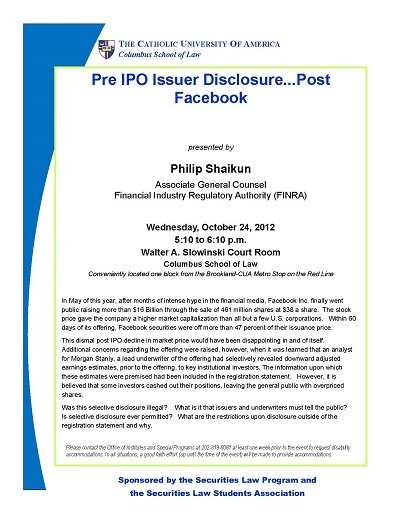 What happened and why was the focus of “Pre IPO Issuer Disclosure...Post Facebook,” a talk at the Columbus School of Law on Oct. 24 by Philip Shaikun , associate general counsel with the Financial Industry Regulatory Authority (FINRA). Shaikun, Philip, "Pre IPO Issuer Disclosure... Post Facebook" (2012). Securities Law Program Lecture Series. 14.